Cloth diapering five kids sounds like a ton of work. After being at it for 6 years (and about to launch into our 7th!) though, I can tell you, it is WAY easier than I ever thought it would be. And, dare I say… we actually prefer it to using disposables! I’m sure you’ve heard it by now–”cloth is sooo much better for the environment…” “cloth is sooo much better for your baby…” etc. Yeah, all those things are true, but that’s not why we started! When we realized what it was going to cost us to keep buying disposables just until our FIRST child was potty trained, we knew we had to do something different. Though really, the only thing different for us is a little extra laundry to plan for, and a LOT less disposables to budget for. We’ve tried going back and forth a few times, using disposables here and there, and honestly (even if we have the extra cash), we prefer cloth diapering for several reasons. Cloth has given us a ZILLION less blowouts, it’s a cinch to adjust absorbency without buying a new pack, we can use the same ones from birth to potty training, and we always have diapers on hand (no more late-night diaper runs!). Aside from all that, they’re just so darn cute. 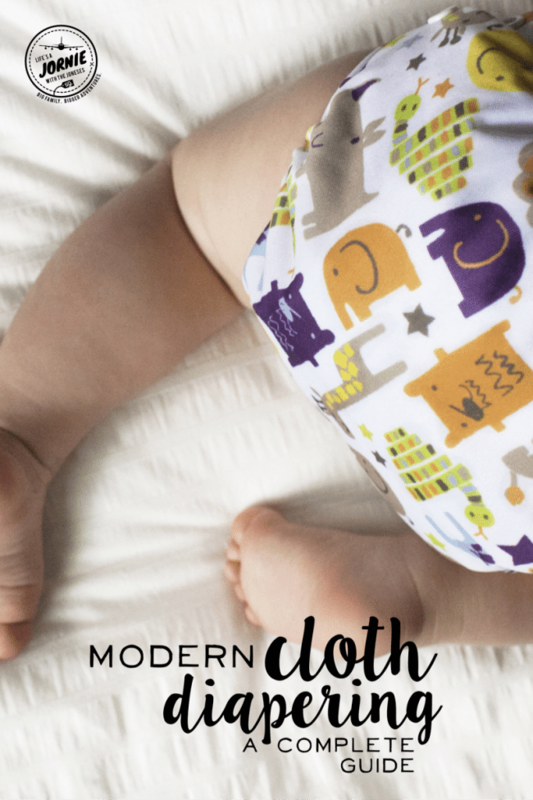 Let me take you through all you need to know about modern cloth diapers. They’re not the kind your grandma used, and for all intents and purposes, they fasten and function nearly identically to disposables. I’ll break it down and before you know it, you’ll be a cloth diaper expert, too. Hi! You mentioned using disposables for newborns… is that what you did? Or were you able to use the Flip diaper straight from birth? I noticed your washing process does not include a rinse wash as I’ve seen a lot of people recommend. Is there a reason for that or do you find it not necessary with your homemade detergent? Just curious as I’m a FTM and I plan on cloth diapering! Sorry about that! It kinda depends on your washer/type of cycle, sometimes you do need an extra rinse cycle and sometimes you don’t. Most modern washers do a pretty good job but older ones may need an extra rinse. I’d just monitor for buildup issues (extra smelly, trouble getting smell out, more staining than usual etc) and strip them by doing a load with a squirt of Dawn dishwashing soap only (no other detergents) and extra rinse if necessary. Hope that helps! These posts have been super helpful! Just wondering – you list the cold wash and hot wash. Are these completely separate cycles and you add detergent for both or is it a pre-rinse with cold water? Just wondering if I need to be essentially washing them twice! does this guide apply for newborns? I have read some blogs saying it is a better fit to get newborn sizes specifically. I am deciding whether to start when the baby is out of the newborn phase, but maybe I will be discouraged after using disposable from the beginning. Any advice?